Matthew 6:9 "...On Earth as it is in heaven." We play for Renaissance events, labyrinth walks, weddings, worship and memorial services. 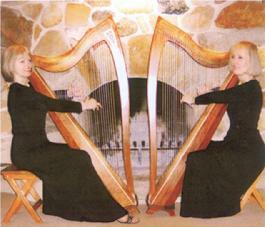 We also offer private harp therapy sessions and informational programs. We have Renaissance, Greek and Biblical costumes we can wear when playing for specific events such as labyrinth walks or worship services. Creating sacred space through the use of costume and music of the period helps to connect people to the river of wisdom and beauty which flows from the ancient past into the present eternal moment.